Even though knives, daggers and swords have been used in magic for a long time, we owe Gerald Gardner with the specifics and uses of the modern day athame. He first mentioned it in his writings in the 1950s and many people may not realize that he actually is the founder of the ceremonial dagger itself. The athame is typically a short, black handled knife with a double edged blade. There are a large number of people that will dull down the tip of the blade so as not to accidentally cut something. Using the blade for self defence, drawing blood or cutting anything makes it null of any magical use. If you need to cut something, a white handled blade called a boline (bolline) should be used. Generally the athame represents Fire specifically because the blade itself is forged in flame. Some modern pagans will use an athame with a wooden blade, and when this is the case it should then be associated with Air. It is common practice to place symbols or inscriptions like your astrological sign on the athame to build up the magical link. When choosing your athame, you should feel comfortable and confident while handling it. Never haggle over the price and remember the athame chooses you as much as you choose it. It should be considered as an extension of the users self. Once it is in your possession try to keep it within your aura for at least a month. This may be hard in some cases for security reasons so try to at a minimum keep it with you while you sleep. Once the athame is consecrated and a strong bond is formed the athame is connected to you and some pagans consider it to have it’s own soul and choose to name it. You should always treat your athame with the greatest respect and it should be a necessary tool for your magic. When you are not using it, wrap it up and keep it with you or in a safe place. 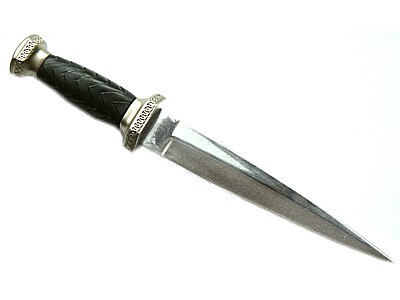 The athame’s primary use is to channel and direct energy. It is traditionally used to invoke the elemental guardians, or calling the quarters and in covens, the athame can be used for initiation ceremonies. The athame has a masculine principle and so it is often used with the chalice(cup) as a feminine principle. This clearly evokes the art of universal creativity and the act of procreation. This tool is important in magical ritual and even though it hasn’t been around for a long time, it has been adopted into ritual and magic since the revival in the 50’s. In the TV sitcom Home Improvement, the father Tim Taylor was obsessed with tools and “more power.” We Wiccans use tools in our spiritual practice and magick and they are means of representing and channeling power. But, there are misunderstandings as far as their necessity, cost and purpose. I met one of my online friends because of a message she posted on a board regarding tools. She asked if it was necessary to have every tool in order to be a Wiccan and if it was necessary to spend a lot of money on them because someone told her both things were true. I posted a reply explaining that she did not have to have every tool upfront, paying more for them did not make them better and when all was said and done, the magick was in her and the tools were just props. We are still in contact and she has returned the favor by giving me advice at a difficult time in my life. It has been said that it is possible to practice magick without any tools but yourself and I have found that to be true. I have conducted rituals and raised power strictly in my head, but I prefer it with tools and find it more fulfilling that way. Seeing tools, especially on an altar, sets the mood and tells your subconscious that it is time for ritual and all the emotions and focus involved in it. I have participated in a group ritual only once and there was an altar and tools as well as a candle for each participant. I imagine that it would be quite difficult to have an effective group ritual without tools because it would not be likely that everyone could have the same focus and imagination that it takes to perform a ritual without tools. Each tool and other items on your altar serve as a visual/physical representation of an element and/or purpose. Besides, it can be fun to find and use them and you don’t even have to grunt, “more power.” It is easier to focus on calling the elements to your circle when you are looking at and touching objects that represent them. Many Wiccans purify the ritual area with the elements at the start of ritual and in my experience it is more effective to have an object at hand, such as a broom to sweep negativity out of the area, than to just visualize it. Candles definitely add to the mood of a ritual and can be used for candle magick. There are items that may not be considered tools in the strict sense, but are quite useful in magick. It would be impossible to work cord magick without a piece of cord or yarn or to use crystals and herbs without having them in front of you. Traditionally, we have images or representations of the Lady and Lord and it is easier to connect with a particular god or goddess when you have an image of them. There could also be items related to a type of magick you practice such as scales for justice or a hex sign for Braucherei. While it is fun to shop for tools at a metaphysical shop or online, especially if you can afford the fancy, pretty ones, it is not necessary and spending more does not make them one bit more effective. I agree with the statement that when you make something you use in ritual, it is embedded with your own personal power, making for a stronger link. While it is not practical to make your own athame unless you are a blacksmith, it is easy to make your own wand and depending on your skill, you could make your own chalice (ceramic or wood) or pentacle altar tile out of wood, wax or ceramic. If you are skilled at sewing, you could also make your own ritual gown. I paid at total of about $65 for all the tools on my altar and spent about eleven years accumulating them. My altar cloth is 3/4 of a yard of a fabric with a moon and stars pattern that appealed to me. My broom is a cinnamon broom that is commonly used for decorative purposes and my wand is a stick from a maple tree in the front yard of a house where I lived at the time that I whittled. The chalice is a green glass goblet with a gold rim that I bought at a fast food restaurant one Yule for 99 cents and my athame is a bone letter opener purchased at a Native American pow-wow. I found my brass cauldron at a yard sale and the glass candle holders I favor can be found at any store for about a dollar each. The images of the Lady and Lord that are placed on my altar are small prints purchased for about $10 each from a Pagan artist. There are things that cost me nothing such as a black raven feather representing air but also a gift from the goddess Morrighan which fell at my feet as I was mowing the yard and a rock I found that represents earth. The important thing when you are acquiring tools is that they appeal to you, mean something to you and fit your magickal practice. I did not purchase a traditional steel bladed athame because I like to work with the fae and iron negatively affects their energy. Two years ago, I was at a local pow-wow where Native American craftspeople were selling their wares and spotted a bone letter opener. I picked it up and held it as I would an athame and it felt right, so I bought it. If you follow a Native American influenced path you will probably want to focus on tools with that theme, but if you are Celtic or Norse, your tools will likely reflect that in some way. If you can’t afford a tool, pass on it and maybe you will have the money another day or something else will come along that you will like better. It is not necessary to have a complete collection of tools to call yourself Wiccan. Until I found the right athame, I used my hand by curling back my ring finger, little finger and thumb like the Boy Scout salute and never had a problem casting a circle. You can use a cup you already have until you find one you want to set aside as a chalice and you could use two candles (which are cheap) to represent the Lady and Lord. I found the process of finding the right tools to be an adventure and learning experience, not to be rushed. You may find over time that your selection of tools changes. My first wand was also a stick from a tree in my yard, but I carved characters in it and stained it. I just didn’t like the way it turned out and it did not feel right in my hand, so I whittled another stick and left it plain, which suited me much better. At one time, I had a Barbie doll in a witch outfit that I used to represent our witchy “ancestors”, but I decided that the image of Barbie was not appropriate. Someone to whom I delivered mail gave me a pewter miniature of a wizard, probably from a Dungeons and Dragons game, which served the same purpose and I felt much better about using it in that manner. Lets briefly review the purpose of the common tools. The broom or besom is used to sweep away negativity and is a symbol closely associated with witches. The athame is used to direct power, particularly in casting and taking down the circle, as well as cutting a door in the circle when necessary. It is not used for cutting anything physical. The wand is used as an instrument of communication, particularly when calling or speaking to entities. The cauldron is an instrument of transformation as well as a place where things come together to make something new. Candles provide illumination as well as having a magick of their own. Incense also sets the mood as well as representing air in the circle. The important thing to remember about tools is that they are a means to magick and a representation of something in ritual. The real magick is in each of us and we channel energy through us and our tools to accomplish our ends. If you think of ritual as a play, our tools are props in that they make it easier to perform the play and make it more meaningful, but they are not the play. Happy hunting in seeking out your tools and may it be as rewarding and educational an experience for you as it was for me.